It was an excellent day and hats off to @ashroplad for his curation of the day. Lots of great presentations but the standouts for me were Carrie Bishop talking about digital by design not default and minimal use of technology and Alison from Pesky People who with humour and determination hammered home the point that technology has no excuse not to be accessible. I also enjoyed hearing @loulouk sharing some of the highs and lows of GDS’s work with social media – great to see a high profile group being prepared to share their less than brilliant experiences as well as the stuff that goes well. I was talking about the way in which networked technologies cause ‘disintermediation’ – removing intermediaries from processes and relationships – and what this pressure might mean for Citizen / Government relationships which are often mediated by the Community Engagement process. My experience is from the digital democracy world – but my point is that the offline process needs to respond the change being driven online. That first one is now back on the drawing board as I think that Carrie is right to talk about digital by design however I also want it to reflect the fact that its about being culturally not just technically digital – might try our digitally native instead – views please! We are influenced by the Asset Based Community Development approach of people like Jim Diers and our starting point for any project is to go and find the people in the community who are already talking as they are the starting point for your network – we use our social media audit process to do this. By running and open and agile process from the start, and by making good use of both digital channels and offline events, we have a developed a new approach to Community Engagement. We also put a shared, robust and OPEN evidence base central to what we do. Up to this point we have strong evidence and experience which shows that this a highly effective – and cost-effective way of approaching community engagement which leaves you with a reusable asset in terms of a platform and a network of ‘willing localists’. We think that this can go further however and so within these principles we embed an objective to create more co-productive outcomes – the final stage of community engagement should be a co-productive and self-managing network of local participants. Over time the investment in creating these networks should reduce the costs of community engagement but more importantly strengthen the ability of communities to help themselves. Community Engagement should be about creating the right kind of relationship between Citizens and Government and as such it should integrate communication, consultation and the democratic process – which means that reimaging Community Engagement means reimaging the role of the representative within it. If we are going to ask more of our communities, and I think the financial picture if nothing else means that we are, then it is vital that we renegotiate this relationship. Here’s the thing. I have tremendous respect and appreciation for people who choose to stand in local elections. Local politics is a fairly thankless task however with a few exceptions we see exceptional public service from our local politicians. At the same time I find it screamingly frustrating as to how slow the adoption of new approaches and behaviours can be within this group. This is an action research diary post for me and as such important that I state my personal bias on this subject (if the above doesn’t make it clear!!). I am a very strong supporter of the importance of having a representative democracy but I believe that elections do not deliver a perfect mandate and that politicians have an obligation to have an ongoing dialogue with their electorate to help shape their views and understand their preferences. I also think that this dialogue needs to be carried out openly and in places where it is possible for as many people as possible to participate. I think that today, to make this possible, politicians will need to make far better use of online tools. I spend a lot of time with Councillors and I am fairly regularly asked to do social media workshops of one kind or another with them – usually by Officers motivated by the same combination of feelings that I expressed above. I no longer use these as an opportunity to talk about tools as I have reached the conclusion that any idiot can learn to use twitter if they choose to (the evidence is there!) and these people are (in the main) not idiots. My belief is that the reason we don’t see wide scale adoption of social media tools is that most members lack the sense of urgency and purpose which would lead them to go online and talk to people. When you dig a little deeper in this there are a few reasons underneath this lack of urgency which I think we can pithily sum up as confidence, ignorance and arrogance. The confidence point is of course about lack of confidence. Many of our politicians are older and often have not had to make a professional adjustment to new technologies in their working lives. In the same way as any other digitally excluded group they need to be given the confidence to try some of this stuff out. This is not about ‘training’ people though basic skills are of course needed. This is more about sitting down and giving people one to one support (in the way its done in social media surgeries) to help them achieve the things they want to do. Yes – this is more time consuming that running a course but ultimately it is hugely more effective. While on the subject of time – the other thing I try and is to help people think about how this will work with their wider workflow rather than as an extra task in its own right. So, if you have people like this in your council then sit down with them and talk about what they might want to achieve online. For some Members it really is as simple as pointing out the growth and centrality of digital technologies for civic use. Those of us who are fairly immersed in this stuff and see the growth in hyperlocal sites or community projects online get frustrated about the pace of change but one of the effects of the online space is the homogeneity of our experience – we tend to see what the people we follow see and this creates an amplification effect around the perceived centrality of social media. The truth is probably balanced somewhere between us evangelist types and the people who are not online at all. Simply pointing out the facts (and there are loads) on online adoption and the behaviour shifts seen with smartphone and tablet take up is often enough to get people thinking differently. By drawing together some of the offline social changes around for example in the shift towards less hierarchical and more networked organisations, or by looking at the public desire for greater openness which is so central to the online world, you can present the growth of social media as a symptom as much as a cause and so give it the relevance it needs if people are going to dedicate time to using it. Want to do something to help these people? Show them the facts. However, there is another group of members who I encounter who object to social media not because they don’t see how it could help but because they don’t think the public want to participate. This will either be spoken of in resigned terms – “I wish the public were interested but they just aren’t” or in a slightly more aggressive tone of “my voters are perfectly happy and don’t need any more contact with me”. The members who make this point are often fairly cross about the idea of more participation being needed – I am not sure if they are threatened or just a bit insulted by the idea. What I am not sure about with respect to the group is whether at the heart of it they are rejecting the idea that we need to change the way we are ‘doing democracy’ which is implicit in my belief that we need greater participation between elections. This group put the problem of democratic deficit fairly squarely on the shoulders of the public who are not turning out to vote. I find this group particularly disturbing because I meet a lot of them – I am not sure I have a suggestion for how to make a difference here apart from persistence and robust debate. Most groups I encounter will have a mix of enthusiasts and openminded learners but there are always some of the these rather angry people who just don’t want things to change. Some of them have a thought out position on this but many that I encounter don’t. It is the balance of these groups within a Council that is critical to moving forward. The more I do these sessions the more I let my frustration show (which is possibly not a good thing) because I think the evidence of the need for change in the democratic process is mounting and we are also close to a burning platform of financial crisis in Local government which, irrespective of ideological concerns will make it essential that we evolve the citizen/state relationship because we will need to the public to do more for themselves. And you know what, there is also evidence that in the right circumstances that they are prepared to do more. This post is really the result of nearly 10 years of observations with respect to asking Politicians to consider how technology can change democracy. When we started suggesting that people webcast their council meeting we were met with a similar set of objections (and the far more relevant challenge of the fact that video over the 56kbps modem really did test your democratic resolve) and in some ways this has not changed. What has changed is the politics around this. We find far fewer Councils where the idea of using technology to make the Council more open and transparent (which is I believe the thrust of the webcasting project) is being rejected or being made to be a political issue and the battle ground around technology in the chamber has shifted to the degree of public participation. Even then we don’t see this splitting along party lines as we did with the webcasting and this is more likely to split along luddite / evangelist lines – with these two groups each having good and bad reasons for their positions. This makes the task of trying to create change programmes with members even greater as we are seeing two different interlocking dynamics as the party / technology groupings are different. Returning to the question of participation, we are seeing more and more social media active members we are not seeing a step change in the way in which Councillors behave and I doubt we will with the current mix of enthusiasts, learners and naysayers. We will continue to see incremental change and improvement in this space but we won’t shift this as quickly as many of us would like without raising the level of urgency about this agenda. What can we do this? This isn’t about getting members online – as far as I am concerned this is about evolving our democratic process to respond to the social changes that we see with a more networked society. Getting members online and using social media could be seen as a positive byproduct of this process which is why the focus has to be on giving them a reason to go online rather than just teaching people tools. There is also the question as to whether you should prioritise democratic reform when the rest of the system needs attention? I think we have to. There are financial savings to be had in changing the way that we manage our democracy and social gains to be made by creating a more connected community. One way of moving forward on this is to remove the buffer zone of community engagement work and start to educate the public about politics. This is problematical as the public demonstrably dislike politics and process (Hansard) but by building the demand for change outside of the usual suspects group of digital evangelists we increase the chances of being heard. Another way is for a body like the LGA to take responsibility for pushing this agenda, or for Political parties to take this on. Another possibility is that we see something like the Pirate Party start to have the disruptive effect that has been seen in other EU democracies. There is an inherent problem with democratic reform in that the time we get to spend on it is limited by the event horizon of the next election. Perhaps the most important thing that may need to happen is for this issue of greater participation between elections needs to gain the kind of persistence in political circles that the idea of openness and transparency seems to have now done so that this debate can grow past the next vote. One of the items we have put in our proposal for Creative Councils is the suggestion that we host an Action Research network looking at the emergent changes in the way in which officers and members are interacting with citizens. Following a fascinating meeting with some local community engagement experts and councillors last week I wanted to let more people know what we are up to as there are lots of opportunities to collaborate – I hope! The exploration of new forms of engagement is a strand of work which has been emerging from the We Live Here project, and to be honest a number of other things I have been working on. Its obvious that if we your ambition is to try to reinvigorate civic participation – or at least give it the environment it needs to flourish in the 21st century – then you also need to work with engagement officers and volunteers to look at how their professional practice needs to adjust to this change. We want to make sure that we are doing robust research into the effects – planned and unplanned – that we are having at the same time as ensuring that we don’t get focused on evaluation rather than progress and we believe that an action research approach will help achieve this. Action research is a method of actively participating in change projects at the same time as conducting research. The ambition with We Live Here, and perhaps further projects, is to embed research practices into the project process so that we can capture the learning that emerges. By making this a wider project than just We Live Here we can draw on wider expertise and draw wider conclusions about the work that we are doing. I feel really strongly that research and practice need to come together to support innovation in any kind of service design. This means that the academics need to get out of their universities and the participants need to build research techniques into their practice. With our project, which is all about building capacity on all sides for more co-productive working then the participants are not just the professionals – we want the community to actively participate in the research as well. Using a research orientated structure for the project also starts to address the question of systematic evaluation. Its difficult to evaluate innovative projects where many of the benefits may be unexpected and where the form of the project may change many times within the project frame. However in combination with the agile approach and a strong vision for the outcome we are aiming for I think its possible to embed a research strand within the project which will support the agile project working and also help ensure that we are changing with meaning. A lot of this is about how we set the project up for the next phase as we have the intention of supporting the work with research then this should be achievable. I also think that the action research approach dovetails neatly with the agile project management approach. You can read more about agile here but one of the essential elements of agile software development is the inclusion of unit and regression testing. Adopting research practices within the project framework does something parallel to this testing within the the social as opposed to the purely technical environment. I will do a more detailed post on the proposed design of the process (when we know how much money if any we have to spend on it!) but as we have continuation money and support from the Council anyway we will be able to implement this in some form. I also hope to be able to find some people at Brighton and Sussex universities who want to collaborate on this as well as connecting with the other projects going on in the City. I was at a meeting discussing this last week and there was some blurring of terms between action learning and action research. I think this very clearly needs to be considered action research. Action learning would imply that we know what these new skills and techniques are going to be and we don’t – we have some ideas about what is needed but until we test and develop this we won’t be able to produce the evidence or systematically reproduce this in learning. The kind of skills and attitudes we see emerging are varied; we need to build facilitation and convening skills. We need to understand how networked power works online and offline and we need to find ways to involve the people who don’t need us but can help us rather than the ones most lacking skills. Perhaps the most difficult thing that is needed is for professional participants to work towards their own redundancy. There is a seductive quality to being needed by communities which needs to be overcome if we genuinely want them to be more self-reliant but that not a new problem – we just can’t afford not to solve it. More than that, if we consider the idea that we are moving towards a radically smaller state (which the finances point towards whatever your political views on the subject) then we also need to give these people a self-belief and skills which mean that they have a personal confidence that there will be something else to do when this community no longer needs them. This is going to be hard. We are only scratching the surface of what this means and we are in common with many other projects who are looking at how the relationship between citizens and state might change in all kinds of ways. Within Brighton there is a developing use of Participatory Budgeting as well as the planned Neighbourhood Councils pilots which are being considered at the next Cabinet meeting. Within Creative Councils Cornwall and York are also looking at different forms of citizen participation and in its widest form most of the Creative Councils projects are looking at this issue of the renegotiation of the Citizen / State relationship. However – I feel that if we don’t start to join up some of these experiences systematically then we miss the chance to draw wider conclusions. I have been combining project work and research for a few years now and though by no means an expert I think the combination of these two mindsets can be powerful. So, the ambition is to create an action research group based in Brighton which will support this process. Rather than trying to formalise it from the start we will just get on with it within the We Live Here project and make it as open as possible to other interested parties – either researchers, practitioners or just the generally interested. I hope that by doing it this way we can attract the expertise we need as well as progressing past the planning stage that so many ideas get stuck in. I’ll be blogging progress here so let me know if you want to get involved. Happy New year! I have been off in a Christmas and PHD (and drink) filled bubble for the last few weeks but as I am back in the office on the 9th I need to catch up on some blogging – which is a welcome change from the tedious but necessary process of brutally editing the thesis. First up is a belated action research post about We Live Here – so Here we go…. We are still in the process of mapping the communities that we are working with and moving on from the first iteration of network analysis which documented the networks and names known by the immediate project team and engagement officers as well as the first online search. We are now starting to conduct interviews within the communities we want to work with as well as doing walk arounds in order to locate civic space and generally observe what is happening in the areas. These walkabouts should be a good way of finding relevant local businesses and also understanding how ‘public’ the community is with respect to shared space – more on that when I have got my coat on and had a trot about…. 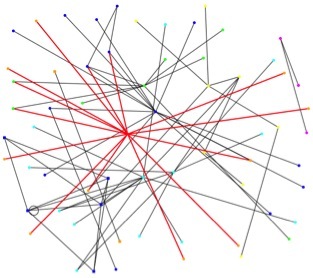 Broadly what we expect to happen is that the star burst pattern shown below will become something more like a tangled ball of wool (or not – it could be that no-one is speaking to anyone else who knows!!). From our knowledge of the three pilot sites we are speculating that we will have one fairly tight network with outliers and one site with much more diffuse participation. The third pilot site is a community of interest rather than place and the project teams don’t have enough contacts to make the same mapping approach to be viable so the first step with this group will be for me to sit down and do an exploratory interview with a couple of the names who we know are central to the network. We’ll do some online research first so we don’t turn up completely clueless. I have to say I am looking forward to this next step as it makes it inevitable that we need to step above the parapet and make the project more visible in the City. I have written before about our hesitancy about this and one of the things I want to do is to get comments from the project team as to why they think it is. Its been going on a while now and I want to try and understand if there is an underlying issue that I am not understanding. In parallel with the mapping work we are starting to develop our thinking as to what the first version of the community sites could look like. We intend these to be a straightforward directory in the first instance which just shows the research results from the area (with all the data protection thinking that this involves) and they will be based on our Citizenscape platform (the nearest example is currently here bit we have got some development work planned in January so expect this to change). We are in the co-production dilemma here – we don’t want to be prescriptive and close down ideas from the community but we do have a view on them and we also know that if we turn up with a blank piece of paper (or digital equivalent) then we will struggle to get anything ready in a reasonable timescale. Our approach is therefore going to be to put our suggestion on the table and then get comments and amend accordingly. As we roll this out the next set of sites will be based on the comments of the community that we have worked with in the previous iteration and so over time we should mitigate our influence and get a better balance of ideas in place. I am in two minds about this – in some ways I am with Steve Jobs who used to say that customer often doesn’t know what they want until they see it. On the other hand underlying design assumptions and attitudes infect code and therefore digital spaces (lex informatica) and we need to be careful that these spaces really are owned by the public. I think one of the issues that this internal discussion has highlighted is one of the inherent misunderstanding that people have about co-production. Put simply – it doesn’t mean you can’t, as the instigator of a conversation, have an opinion. The idea that we go values and opinion free to any interaction is one of the misconceptions which has got politicians into such a pickle and destroyed so much trust in the process. OF COURSE WE HAVE AN AGENDA!!! No-one believes we are just turning up for the sake of it – we want something to happen. More seriously – this is actually more than just a misunderstanding. Firstly – I think that community engagement practitioners are rightly oriented towards getting people’s voice heard not speaking for them. Taking part in the conversation rather than facilitating I think firstly exposes practitioners as overt actors in their own right and this is not necessarily a comfortable place to be. Secondly it risks reducing the power available to the community – there is only so much conversation time. This is not a new issue – its something that practitioners in the developing world are very familiar with and this where a lot of co-production theory and practice comes from (Gavanta, Cornwall). The fact that we have an agenda doesn’t mean that the outcome we initially set out is what is going to happen however – we are very committed to the need for communities to shape their own spaces and we are very aware that anything that we create or impose of them will not work (Ref: eParticipation – if we build they really won’t come). This is really where co-production ‘lives’ – where you come with an objective and an suggestion and then enable the participants to take that where they want to go. Further into the project the balance in this should be redressed with conversations being instigated as often by the community as by the project team but this is currently aspirational. For this to work we need to be very open and transparent with our agenda – which we are calling our Statement of intent. We also need to be very open and accepting of change to this intent both from the results of the actual practical process and also with as we start to get more input from people outside the core team. Our first step towards this happened before Christmas with a meeting of our “Non-Steering Steering Group” who are a varied group of active individuals, practitioners and subject experts from around the City. The most reassuring aspect of the meeting was the fact that everyone was clear about what we are trying to do and broadly in agreement. In terms of adjusting our thinking – the discussion showed a much wider opportunity for using the civic spaces we hope to create for engagement with other governmental organisations (in the first instance the Police and NHS) and we were also steered towards thinking more creatively about how we interact with the business community something which needs to be developed a bit more. We Live Here has been created to try and strengthen the democratic process within Brighton and Hove. We want to get more people involved in a way which is meaningful to them and we want to ensure that the elected representatives are going to work effectively with this increased participation. We think that these networks, when connected, create a civic space which should mean that civic society is more visible in our communities. We believe that the governance of the civic space should be in the hands of the participants and not with the Council either with respect to officers or Members. This statement is our initial objective – we believe for this project to work we need to allow communities to shape the objectives for themselves and that we need to create a transparent and accessible process for this to happen. We’ll be tweaking this a bit / a lot and will publish our first proper draft on the website. This question of governance of the Civic Space is something that is currently in ‘the ring of uncertainty’ which is project team speak for something that we hope will be easier to answer the longer we wait. We are clear that these spaces need to be curated and not moderated and we are also clear that this needs to be managed by the communities that they represent (with a small R). However – at this point a deep unease and worry sets in – what does this actually mean? Who are we empowering, how can we stop this going wrong? Should we stop it going wrong or even have an opinion about what wrong means? At this point we all step back and take a deep breath – this is not as complicated as the worst case scenario analysis would make it look. My background is with online rather than offline community and I am perhaps on the more robust end of the spectrum on this. I think we need to leave it to communities to figure it out and if their civic spaces become unpleasant places to be then we need to make sure that we have a robust path of appeal and peer group review. Actually – most communities (and in particular online) tend towards the reasonable and self-manage brilliantly but that doesn’t stop the free floating anxiety around the idea that we are going to put people in a bag and suggest they fight it out like ferrets. One of the elements we come back to repeatedly is how we reciprocate for effort within the community. We don’t just want to turn up with a list of demands and get people to do stuff – the idea is both that we are helping them to achieve ideas that they already have but also that we are using the energy and interests of the community to fuel the civic spaces. We will of course be funding community meetings and buying tea and buns when necessary but more meaningfully we hope to be able to make connections to other resources in the Council that might not be transparent or accessible to people outside of that environment – we are calling these positive byproducts. One of the aims of the mapping exercise is to start to highlight some of the reciprocal benefits that we can bring to these communities but this highlights a big elephant in the room. Should any of this reciprocity be in the form of funding? There are some brilliant projects that have been funded by Councils in the past but they won’t all be funded in the future. This is an uncomfortable sentence to write but the reality is that the funding is not there and the current economic and political climate is not going to change within a short enough timescale to save many of them. We risk losing an amazing infrastructure at the same time as we rid ourselves of some dead wood. With respect to the funding / We Live Here issue we have a practical problem as to how we manage the transition and ensure that we help organisations and we also have a philosophical question with respect to what actually should be funded in this new context. This forces us to consider what we believe the benefits of the project will be – beyond the slightly intangible ambition to strengthen the democratic process which is difficult if not impossible to translate to the balance sheet. Our working assumption is that more networked and visible communities that are actively self-managing will hold more social capital and as a result be more resilient. Resilience is something that we can put a value to. This is something we need to establish over the course of the project. In the meantime I expect we will do some tricky financial horsetrading with the organisations that want to work with is – all the time hoping that we are not setting any precedenets that we can’t live with.